You hear it every time you visit the dentist: daily flossing helps prevent cavities and gum disease. Yet hardly anyone does it or if they do, they floss only occasionally. Benefits of daily flossing are many. First and foremost, most cavities form between the teeth where toothbrushes can’t reach. No matter how well you brush, a toothbrush will never reach those areas. Flossing removes food, bacteria, and plaque each day and prevents cavities from forming. The second benefit of daily flossing is that it prevents, treats and can even help reverse gum disease. Floss helps remove bacteria that make your gums detach from your teeth. Individuals with gum pockets, or mild gum disease, can help healthy tissue reattach to teeth. Failing to floss can lead to total loss of teeth due to lack of support. Receding gum lines result from tartar buildup and can creep down to root surfaces, exposing them when you smile. Your teeth will begin to appear longer and feel more sensitive, while spaces between them will begin to accumulate more food and make them less aesthetically pleasing. Fresher breath and less visible tartar build-up are other benefits. Bacteria will have less of a chance to calcify into dark brown or black tartar on your teeth. 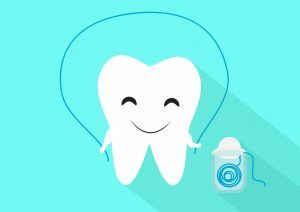 Flossing will also make existing dental work, such as crowns and fillings, last longer because you are cleaning them well each day. It’s never too late to start flossing and incorporate it into your daily routine. If you need a refresher on how to properly floss your teeth, the American Dental Association provides a variety of resources and dental tips that include videos and checklists. Incorporating the habit into your daily routine is simple and can start showing benefits in just two weeks. Find a method, along with a specific type of floss that works best for you. If holding a long piece of floss isn’t to your liking, then use a floss holder. Similarly, there is no right or wrong time to floss your teeth. Some people do it before brushing their teeth, some do it afterward. Just do it.